Maybe Oscar De La Hoya has got it wrong, and his close (in the opinion of some, not in the opinion of many others) but losing fight with superstar Floyd Mayweather is not the real example of a blueprint on how to defeat the 44-0 master. Maybe – and it’s testament to Floyd’s greatness that we have to clutch at straws in such a way – we have to go back to the night of April of 2002, and Mayweather’s tough, close and gruelling encounter with Mexican warrior Jose Luis Castillo to find anything approaching a genuine blueprint on how to beat him. It’s certainly interesting that Mexican fighters have given Mayweather his toughest tests (Castillo and Mexican/American De La Hoya being right at the top of the short list) and maybe Saul Canelo Alvarez will have studied both fights in his preparations for “The One,” which is now just days away. Going up against Castillo, at The MGM Grand in his second home of Las Vegas, a 25-year-old Mayweather Junior challenged the 28-year-old “El Terrible” for his WBC lightweight crown. What happened in the ring became the subject of great debate; becoming even more so as the years have passed and as Mayweather’s greatness has grown. Was Castillo robbed that night a decade-plus ago, or at the very least, is the Mexican the only man to have come close to putting down a blueprint (there’s that word again!) on how to defeat the exceptionally gifted multi-weight king? Mayweather won the early rounds that night, but Castillo, an underrated boxer who was also uncommonly tough, came on after a slow start and began putting rounds in the bank. How did Castillo achieve the mid-rounds success he enjoyed? – by forgetting about Mayweather’s head and instead targeting, with efficiency, his midsection – which is just what many experts have said Canelo must do on Saturday night. Castillo, cutting off the ring, boxed a patient fight, he did not get flustered by Floyd’s superb defensive moves and head movement, and he also leant on Mayweather, looking to both slow him down and tire him out. And Castillo came darn close to pulling it off. Later, Mayweather underwent surgery on his left shoulder (Floyd partially blamed his damaged rotator cuff for the close win) and the two boxed a rematch; with Mayweather winning in a more clear manner this time. But some fans have refused to forget about that first fight. 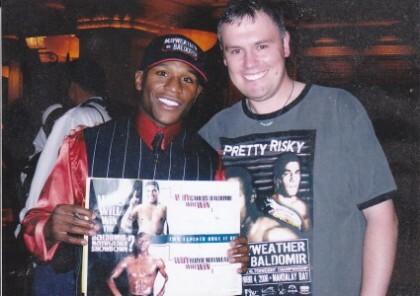 In light of how Mayweather has never been pushed so hard, either before or since (with the possible exception of the De La Hoya encounter), fans who hope to see the other guy win whenever “Money” puts on a show point to the April 2002 fight as proof that it can be done. Castillo was a great body puncher and he was able, at times, to use his edge in physical strength, combined with his talent for torturing the bread basket, to get to Mayweather. Maybe, just maybe, a faster, younger and stronger Canelo Alvarez will be able to go one better! Canelo, as we all know, WILL be the bigger, stronger guy on Saturday night, and Alvarez’ body attack can be nothing short of devastating. Add to this the fact that Mayweather is not quite as blurringly-fast as he was when he was a 135-pounder (although Floyd sure hasn’t slowed down too much), and the upcoming fight sure looks interesting. Canelo is a big, powerful 154-pounder (152-pounder on the scale but more like a 160-pounder come fight time) and as a result he certainly cannot be written off as giving Floyd his toughest, most physically demanding test since the first rumble with that man from Mexicali. If Canelo can lean on Mayweather the way Castillo did (and Castillo was never as fast as Alvarez, was he), and if he can bang away to the body, the younger man may not NEED to be super-fast. And if Canelo can dictate the action by using his physical strength and body attack, and if he can slow Mayweather down, and use his considerable counter-punching skills, he will have a great chance of being able to make it HIS fight. Mayweather is a huge favourite to win and he can never be betted against, but many good judges are predicting a tough win for “Money.” Maybe a hard-fought 12-rounder will be witnessed on Saturday. Maybe even one that is somehow won by Mayweather’s latest Mexican rival. Or then again, maybe will we get a 12-rounder, but a fight not altogether dissimilar to Floyd’s commanding win over the tough but limited Carlos Baldomir.